My Duesenberg Ride -SJN533 ! In April of 2007 my brother-in-law arranged for me to ride in the Nethercutt Museum's Rollston bodied SJN J533, Chassis 2563. I'm still grinning from ear to ear after the experience. I know exactly how Jack Barker felt! JB Nethercutt bought this car in the 1950's. He sold it to Harrah's, and I have a copy of Automobile Quarterly (1972) that shows the car, and gives Harrah as the owner. Nethercutt bought it back some time later. 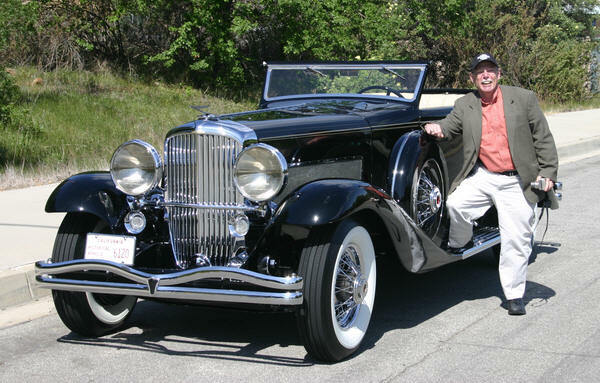 According to a post by Randy Ema, this car appeared in the original "The Great Gatsby", but the 1926 version is too old. Perhaps the 1949 version with Alan Ladd? The Nethercutt Museum is a real treat for the car lover, and it's free! More info here! I can't say enough about how gracious and hospitable the staff was! You can tell from my smile that this was one of the true high points of my life! Check out these books and videos that feature the Duesenberg! © Copyright 2007-2009 Robert S. Rodgers. All rights reserved.